Wheats form a complex arranged in a polyploid series: 2n= 2, 4 and 6x. A great many species have been described in the past, but they are much reduced now. We adopt here the concept of biological species, by including in one and the same species all the types which share the same genomic constitution. For example, spelt is Triticum aestivum subsp. spelta. 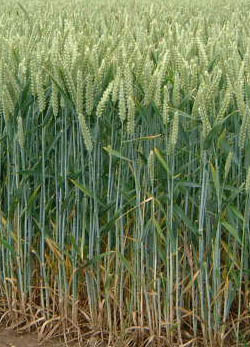 Other authors prefer using species names as equivalents of "crops", and then spelt is Triticum spelta. Both systems are vaild, the last one having the advantage of shorter names. We can merge all Aegilops into Triticum, so that polyploid Triticum are simply interspecific hybrids within one genus. Another solution is to create names of hybrid genera, or to adopt the concept 'one genome = one genus'. This has also been done, but it results in such a confusion, many complex names being created, that it is quite never adopted. Most workers prefer letting the situation as it is, with two genera, Triticum and Aegilops. This solution doesn't solve the question of species delimitation, but allows to maintain communication at a fair level. Nesbitt, M., 2005. "Grains," in The cultural history of plants. Edited by G. Prance and M. Nesbitt, pp. 45-60. New York, Routledge. This page was last modified on 23 June 2012, at 11:55.